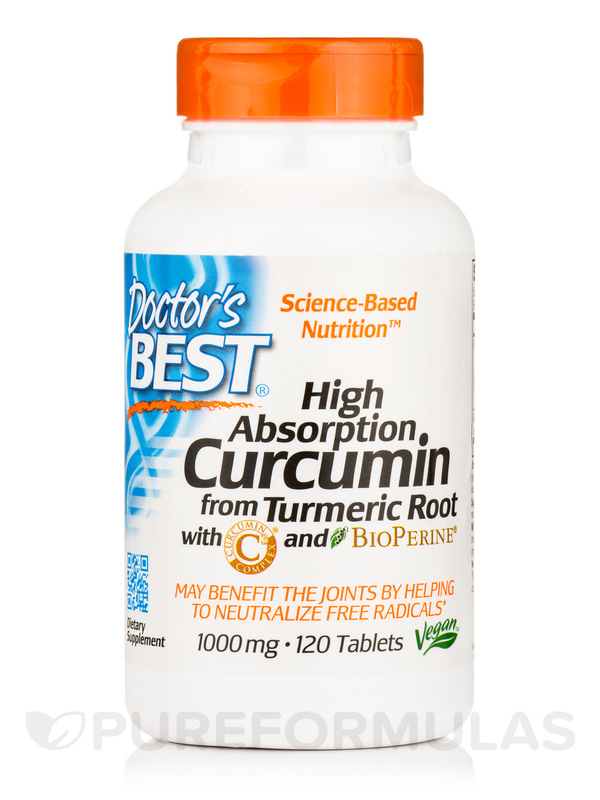 I used Best Curcumin C3 Complex with BioPerine 1000 mg by Doctor's Best for awhile and decided it wasn't doing much. Have been off of it for a month and the pain in my feet is back. Give yourself the benefits of robust antioxidants‚ when you use Best Curcumin C3 Complex® with BioPerine® Tablets from Doctor’s Best®. This formula is designed to provide protection from free radical damage down to the cellular level. It may also support healthy joint function and promote mobility. This formula includes the extract of Curcuma longa‚ or turmeric root‚ which could provide curcumin along with black pepper extract BioPerine® to enhance its absorbability. Together they may help counterbalance the damaging effects of free radicals that may intimidate cellular integrity. Research shows that curcuminoid compounds could extend its support to brain‚ heart‚ joint‚ and circulatory health. 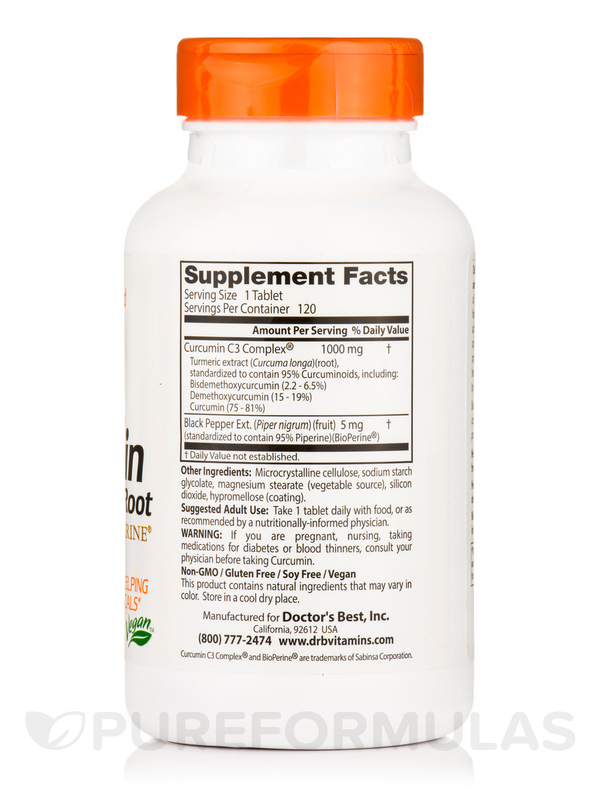 This nutritional supplement from Doctor’s Best® may have powerful anti-inflammatory properties and it is likely effective in reducing growth‚ development‚ and spread of certain anomalous cells too. 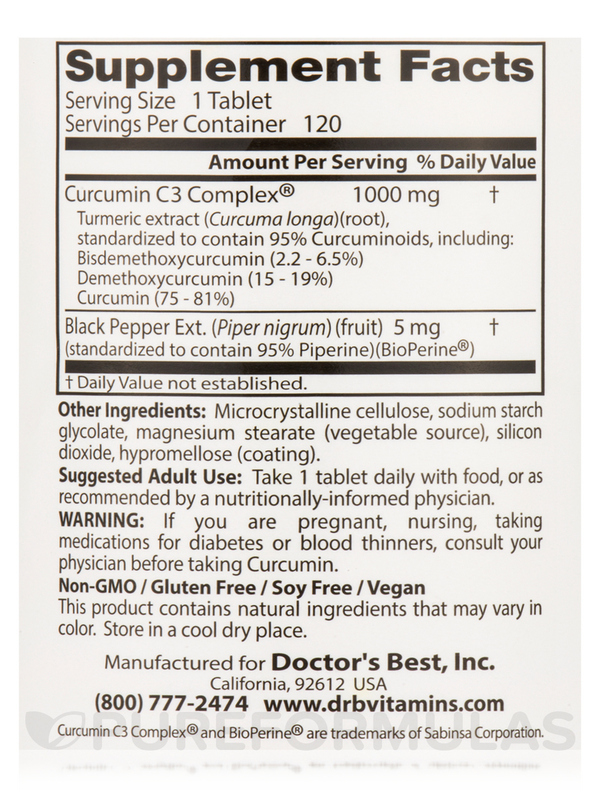 Start taking Best Curcumin C3 Complex® with BioPerine® Tablets from Doctor’s Best® and protect yourself from free radical damage. Other Ingredients: Microcrystalline cellulose‚ stearic acid‚ magnesium stearate (vegetable source)‚ silicon dioxide‚ croscarmellose sodium. Take 1 tablet twice daily‚ with or without food. Consult a healthcare practitioner prior to use if you have gallstones. My wonderful Rottweiler "Cuber" sadly has cancer , I am working with a practitioner that has recommended Best Curcumin C3 Complex with BioPerine 1000 mg by Doctor's Best twice a day to keep the cancer in cheek , So far looking Good ! I have been reading a lot about turmeric with bioperine. There have been some studies showing benefits for arthritic pain. I have taken Best Curcumin C3 Complex with BioPerine by Doctors Best for several days now and it has reduced my pain a lot. I like the quick pain reduction. I wish it was cheaper. I had been using another curcumin product for inflammation. When I ordered this I mistakenly thought I was getting capsules. I always open capsules and just take the powder. However I realized I had a tablet. It is large and very very hard. I ran it through my coffee mill to break it up so that it could be more easily digested. To my surprise there was neither smell nor taste of curcumin. The other product I had been using tastes very strongly of this potent herb. I will go back to it as I feel it is MUCH more potent and effective than this product could be. I could actually feel it working - it so relaxed me that I had to be careful not to get too much of it or I just wanted to rest and relax all the time. I took this product once and could feel no effect whatsoever! Curcu-calm is the go-to for a curcumin supplement. 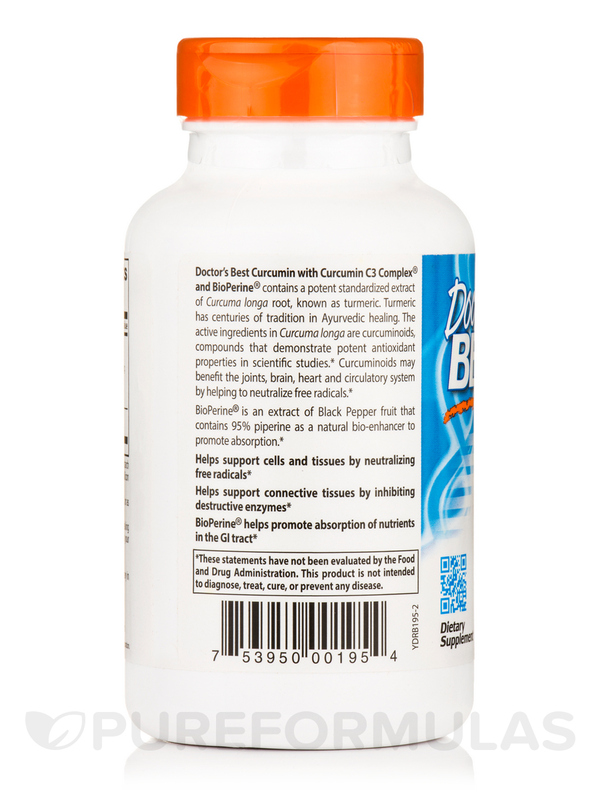 I ordered Best Curcumin C3 Complex with BioPerine because its supposed to help with inflammation. 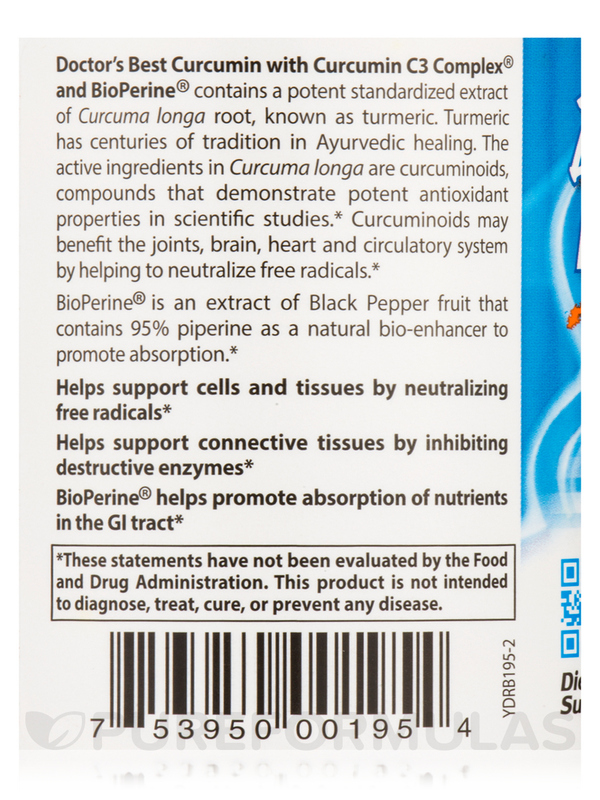 I havent been taken Best Curcumin C3 Complex with BioPerine long enough to know if it works. Im hoping it will. Ive only been using Best Curcumin C3 Complex with BioPerine for about 3 weeks. My skin and eyes looks brighter and clearer after using Best Curcumin C3 Complex with BioPerine. I also feel cleaner inside.